Dark Ink Art and Acme Archives Direct have released the newest poster in their popular The Simpsons Screen Print Series! 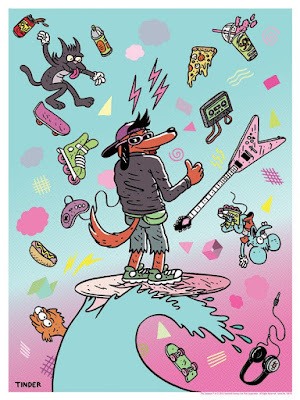 Based on the Season 8 episode “The Itchy & Scratchy & Poochie Show” comes this hilarious “Poochie” screen print by Jeremy Tinder. “Poochie” by Jeremy Tinder is an 18”x24” hand numbered The Simpsons screen print. Limited to just 200 pieces, this print can be purchased now at the Dark Ink Art online store for $50.